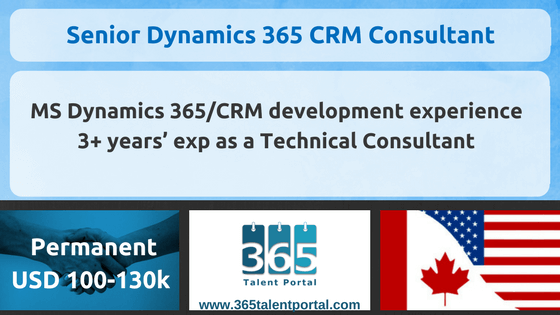 Our client is looking for a Senior Dynamics CRM Consultant with deep technical Microsoft Dynamics 365/CRM business process and implementation experience. Our client’s CRM solutions incorporate technologies beyond CRM. In this role, the Senior CRM Consultant will engage in senior level business (CxO) and/or technology decision maker discussions related to integration, business value, and business process. The goal of the Senior Consultant is to become a ‘trusted advisor’ to our Dynamics 365/CRM customers. You may have involvement in assisting pre-sales activities including estimate creation/review, POC scoping and oversight and partnering with sales teams. You will also demonstrate expertise in collaborating with and mentoring other consultants, driving thought leadership within a consulting practice. You have a BS/BA degree or equivalent work experience combined with a minimum of 3 years relevant working experience including expertise in enterprise architecture as well as business solutions deployment with an emphasis on CRM applications. Higher relevant education (Masters, Certifications) is desirable.